Salmonella Reignites Debate Over Antibiotics : Shots - Health News The most troubling aspect of the latest Salmonella outbreak, according to some food safety critics, is that the strain that's making people sick is resistant to several antibiotics. But contaminated meats can't be recalled until they actually cause illness. 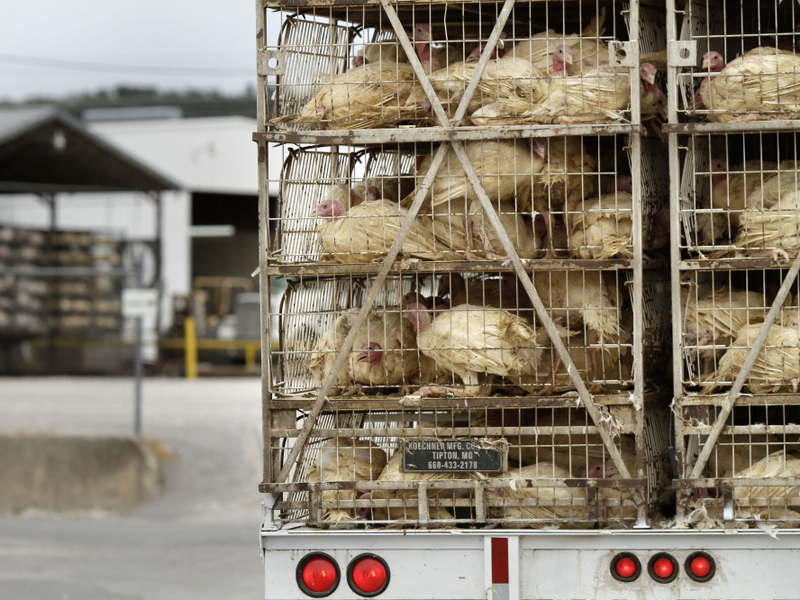 A truckload of live turkeys arrives at the Cargill plant in Springdale, Ark., on Aug. 4. Most turkeys in the U.S. are given low doses of antibiotics, which breed resistant strains of bacteria, including Salmonella. With one death and 77 people reported ill, the latest foodborne illness outbreak has led to one of the largest recalls in U.S. history. Food giant Cargill pulled a staggering 36 million pounds of ground turkey from the market. And the victims in this case have gotten very sick — almost one-third have ended up in the hospital. The most troubling aspect of the outbreak, according to some food safety critics, is that the strain of salmonella that's making people sick is resistant to several antibiotics. So how did this happen? Farmers who raise food-producing animals use about 29 million pounds of antibiotics each year, according to the Food and Drug Administration. That's about four times as much as doctors prescribe to people. "Animals are given antibiotics for a number of reasons — including to get them to grow faster," explains Gail Hansen, a veterinarian who works for the Pew Campaign on Human Health and Industrial Farming. "[Antibiotics] are given to perfectly healthy animals to convert their food more efficiently so they can get to market faster." And she says this practice of routinely adding low doses of medicines to animal feed is creating bacteria resistant to antibiotics. Salmonella Heidelberg — the strain that has made people sick and led to the recall of ground turkey meat — is resistant to three different antibiotics: ampicillin, streptomycin and tetracycline. There are alternatives that doctors can prescribe to treat people who get foodborne illnesses. But Hansen says it's an example of the problem. After years of relative inaction, the FDA has begun to respond on the issue, calling the development of antibiotic resistance a serious public health threat. In June 2010, the agency released a guidance document, which is still in draft form, that recommends phasing in measures that would limit the use of certain antibiotics in food-producing animals. "Using medically important antimicrobial drugs as judiciously as possible is key to minimizing resistance development," wrote Bernadette Dunham, director of the FDA's Center for Veterinary Medicine in a statement last June. The watchdog group Center for Science in the Public Interest has petitioned the U.S. Department of Agriculture to change its policies, too. Currently, explains CSPI's Caroline Smith DeWaal, salmonella is not considered an adulterant. This means contaminated meats can't be recalled until they actually cause illness. CSPI is asking the USDA to classify the Heidelberg strain and three others that are antibiotic-resistant as adulterants. "Hopefully it would result in earlier recalls before there are outbreaks (of foodborne illnesses)," says Smith DeWaal. The National Turkey Federation says it will keep working with federal agencies on efforts to address antibiotic resistance. "We think the thoughtful way to which the FDA is moving ahead with its framework is a positive way to look at antibiotic use," says Sherrie Rosenblatt, who's vice president of the federation. But she says people should understand that antibiotic use is necessary. "We really believe that the responsible use of antibiotics to provide safe, nutritious, affordable foods is the appropriate way to go," says Rosenblatt.